U.S. Army soldiers are required to take a physical fitness test at least once each calendar year that measures their muscle strength, cardiovascular strength, and endurance. The Army Physical Fitness Test (APFT) test uses three events to measure physical fitness: push-ups, sit-ups, and a timed two-mile run. Soldiers must score a minimum of 60 points on each event. The test also can affect whether or not you get promoted since scores are used in the Army Enlisted Promotion System. The test is administered in accordance with the procedures detailed in the Army Field Manual. Soldiers who fail any portion of the Army PFT must re-take the entire Army PFT within three months (unless they have an approved medical profile). Soldiers who fail the Army PFT are not eligible for promotion, reenlistment or enlistment extension. 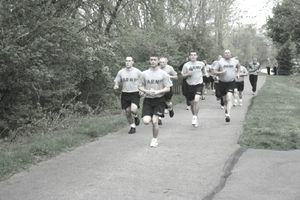 If you can't complete the two-mile run due to medical reasons, Army regulations allow alternate aerobic events. There aren't any substitutes for the sit-ups and push-ups. Push-Ups. Proper hand placement can determine how well you perform. Place your hands at just below shoulder height and just greater than shoulder width apart, with fingers pointing at the 11 o'clock (left hand) and the 1 o'clock (right hand) positions. Your upper arms (above the elbows) should create a 45-degree angle with your torso when in the "down" position. Situps. Pace yourself. Many people fail sit-ups because they start out too fast and fail to match their performance in the first 30 seconds in the rest of the event. Set a goal pace of (approximately) 20 sit-ups in 30 seconds. This can be done with practice three to four days a week in timed 30-second and one-minute sets. Two-Mile Timed Run. Plan to run four to five days a week. Alternate with fast run intervals of 1/4 to 1/2 mile distances at above pace speed, as this will help you to develop "muscle memory" for your pace. Learn to do a two-mile run after days you do upper-body work (push-ups, sit-ups, pull-ups) so you get used to the transitions of the actual test. For pushups and situps, you can actually increase your scores significantly in two weeks. There is a system called the Pushup Push and the Situp Push where you do pushups and situps every day for 10 days straight. Then you rest from doing any pushup or abdominal exercise for 3 days and you re-test yourself on day 14. But don't plan to start this, or any other exercise routine, at the last minute; you're more likely to be successful if you pace yourself over time. The transition from the upper body calisthenics part of the Army PFT test makes running the two-mile timed run more difficult. Use the "rest time" in between events to stretch your upper body prior to running in order to get your best performance on the fitness test. What Is an Army Major General Rank? What Is the Role of the US Army Inspector General's Office?